Finding your match is hard enough, as is online dating. But matching up politically is a priority for many people, not just in the Washington-area. WASHINGTON – The date is going well, the conversation is flowing, until he mentions he voted for Mitt Romney. Maybe she mentions over a glass of wine she loves Dennis Kucinich or can’t wait until Ron Paul is taken seriously in the mainstream media. It’s the moment when a date can come to a crashing halt for the politically inclined in Washington. 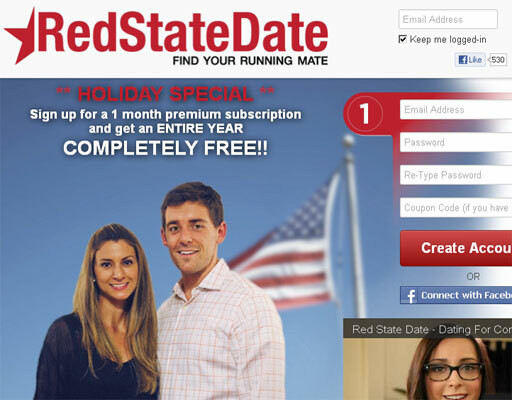 RedStateDate.com and BlueStateDate.com are two dating sites aimed at connecting like-minded people with their running mates, or so the site’s tag line goes. Alex Fondrier creator and chief executive officer of Political Matchmakers, the company that owns the websites, says it’s about finding someone with your shared values. “When it comes to long term relationships, when it comes to marriage, when it comes to raising children is when those shared political values become more important,” Fondrier says. Just like most dating sites, users list their education, location and interests, as well as their political attributes. Users also can post who they consider to be their most inspirational leader, what kinds of talk shows they watch, their favorite philosophers and the issues they care about the most. There are dating sites connecting Christians, dog lovers and vegetarians, so the emergence of these two political dating sites does not surprise online dating expert Julie Spira. “Politics is a huge hot button. You’ll see many of the larger dating sites have a place you can put your political views or not,” Spira says. But most of them don’t go into the depth RedStateDate and BlueStateDate do. “[There is] a three-part political assessment that asks you a couple questions on your economic, foreign policy and social views, so we put you on the political spectrum there. But you also have a breakdown of how you scored,” Fondrier says. Along with identifying where they fall in the political sphere, users can weigh which issues are important for them to find in their match. “If you’re like a New England Republican, and you want someone who is conservative on economics and more liberal on social issues, well, you can just move the little dials and customize it however you want,” Fondrier says. The more questions, the better, says Spira. She says she believes the more thought users are willing to put into their profiles, the better match they’ll get and the more personally involved they are in the process. “It shows you take your values very seriously. Most people don’t sit around looking for 500 or 300 or 200 questions to answer on their computer. So hopefully it really will be able to describe a two-dimensional profile with a little bit more of a personality in a more three- dimensional way,” Spira says. BlueStateDate and RedStateDate launched in October, right before the general election, when most voters and daters were deciding how they felt about the issues facing the country. So it’s not surprising that the sites are doing well given the timing, but Fondrier says in the Washington area, membership is taking off. Ten percent to 15 percent of the sites’ total users live in the Metro area. “The age of users in the D.C. area are considerably younger than in the rest of the country. We’ve got people in their late 20s early 30s predominantly in D.C. and D.C. suburbs,” he says. Relegating your online dating to those in your own party is something that sparked a reaction at a Georgetown store recently. D.C resident Laura Johns says she can see why it would do well in the nation’s capital. “I think it has potential for success because people do care about it especially in D.C. where everyone is kind of more politically aware, politically motivated and going to a rally is actually a thing you’d do together,” Johns says. But she does not think signing up for a politically-inclined site is something she’d consider when dating, calling it unnecessary for those who use it. “I feel like they are prioritizing [politics] because they think it’s associated with a group of ideologies that would make them incompatible, would be my guess,” Johns says. A Brown University study published in September 2011 found that online daters are reluctant to identify politically and weigh politics low on their priority list. But the study’s authors theorize that might be because users do not want to detract possible matches. “Our best guess is that in the short-run most people want to cast as wide a net as possible when dating. However, in the long-run shared political preferences become a critical foundation of lasting relationships, despite the fact that many Americans are not even interested in politics,” says Casey A. Klofstad of the University of Miami, one of the study’s authors in a news release. Previous studies have shown that spouses share political views more than almost any other trait, with religious affiliation being the exception, the study’s authors write in a news release. The study sampled 2,944 profiles from a “popular dating site” and found only 14 percent of users included political interests in their profile. “I had a tough time finding someone who shared my political views or was ever interested in having a conversation about politics,” Fondrier says. That’s where he got the idea to launch the site from his home base in Southern California. It’s all about how users use a site targeted toward a certain group, Spira says. If politics are important to a dater, a site like this could be an option. “Typically with these niche dating sites, the members are already on another larger site that has a larger membership base, maybe in the millions. The smaller niche sites don’t have as many people to match you up with. So typically these days, a serious dater will join one to three sites and they don’t put all of their eggs in the same digital basket,” Spira says. But why two websites instead of one? The two-party nature of American politics drove that decision, Fondrier says. But he worried the approach might dissuade those who are not a “rubber stamp” for their party. So instead of a PurpleStateDate, users are asked to identify with one party — red or blue — and then adjust their stance through using the questionnaire. “If there’s one thing we’ve learned from the election, there are divergent views within these political parties. We really tried to cover all of our bases when it comes to ideology,” he says. So far, several hundred people have signed up for the sites in the Washington- area. Spira suggests that serious daters use multiple dating sites, but cautions that online dating is only one vehicle for finding love.